Aim: The aim of this study was to verify the pain behavior to electroacupuncture (EACP) in rabbit tooth-pulp assay. Methods: Albino rabbits weighing 1.5-2.0 kg) were pretreated with saline or morphine (5mg/kg, e.v.) 10 min before the nociceptive test (NT). In another group, EACP (rectangular pulses, f1=2 Hz, f2=0.1 s, 3 mA) was applied in acupoints and sham points, before and during the NT. After 120 min, EACP was withdrawn and the nociceptive threshold was measured every 10 min until the initial nociceptive threshold was achieved. Results: EACP, using the Yintang, ST4 and ST5 acupoints, induced an increased in the nociceptive threshold and this effect persisted for up to 2 h, even after the removal of electric stimulation. Application of EACP at sham points did not show significant analgesic activity. The present results demonstrated that males presented a higher initial level of analgesia, but a poorer maintenance of analgesic effect after the EACP procedure, while females demonstrated a long lasting analgesic effect even after discontinuation of EACP. Conclusions: EACP presented an analgesic effect in a rabbit tooth pulp assay that was probably due to the release of endogenous opioids. The duration of this analgesic effect seems to be different for males and females. electroacupuncture, tooth pulp, analgesic effect, endogenous opioids, pain. 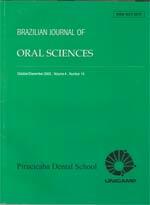 © Copyright 2010 Braz J Oral Sci.